I have sailed Sunfish class sailboats since I was a teenager. 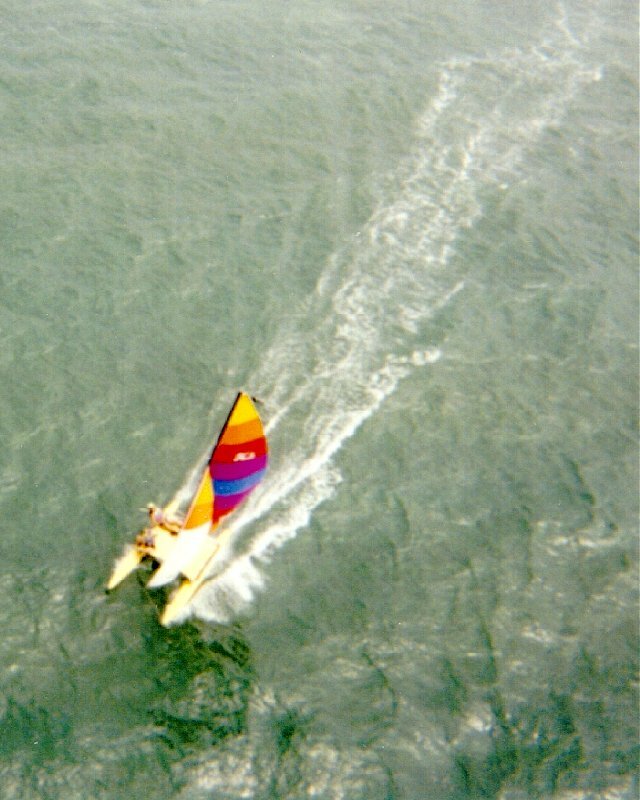 About 1991, I purchased a used 16' Hobie. My family was spending a week at the beach every summer then, and it was a blast to have there. My 41' sailboat is like a Cadillac (slow and comfortable), whereas the Hobie is like an open cockpit sports car - fast and wide open to the weather! Over the years that boat has not only given my family great pleasure during our annual week at the beach, but also young children who like to "touch the pretty sail boat". I have taken numerous strangers out for their first sail  from 6 years old to 80 years old. Due to changes in vacations and life, I sold the Hobie in June 2005. 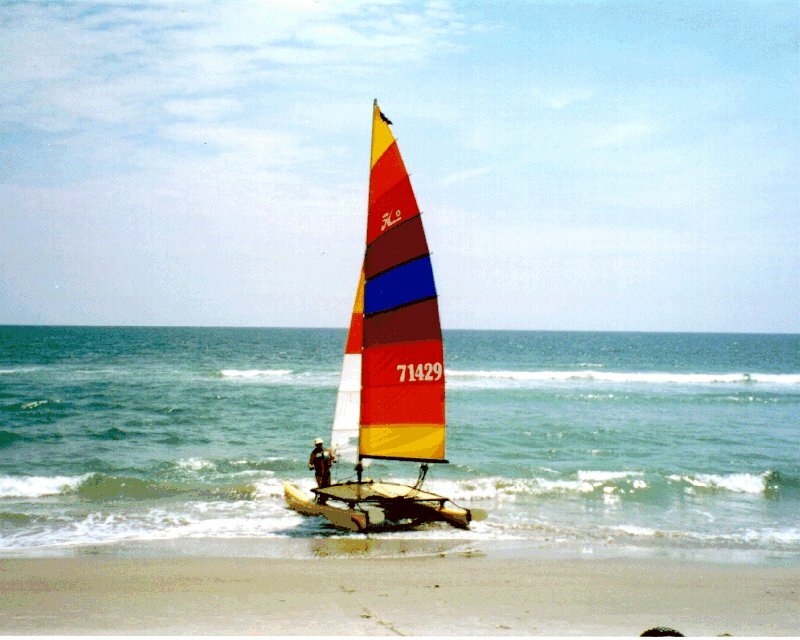 Longest Voyage - ~30 miles from Myrtle Beach, S.C. to Holden Beach, N.C. It took about 4 hours. Farthest Off Shore  ~10 miles to a Libyan freighter anchored off the coast. Most Interesting Sight  passing over a 6 shark that was feeding on the refuse from a shrimp trawler cleaning his nets. We passed the shark between the pontoons while he was on the surface! Worst Moment  turning over in rough surf with two people flying on the trapeze. My son and niece unhooked without any problems. Justin and I got the Hobie turned preparing to right the boat, when a series of waves started driving the boat inshore. We finally got it righted about 50 yards offshore. Several of the battens pockets in the main sail were torn  but that was the worst of the damage  fortunately. Wildest Ride - Justin and I took the Hobie out for a speed run. With both of us on the trapeze we hit 18 knots, but also dumped the boat 3 times on the same single outing. Click on the thumbnail pictures below for a larger view. Picture 1 shows me ready to go - just waiting on a passenger! Picture 2 shows me giving lessons to a friend on her first time using the trapeze. 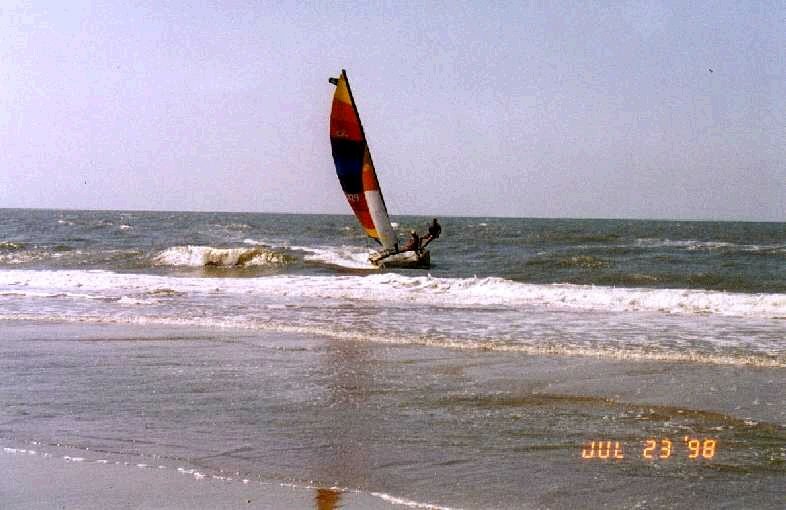 Picture 3 shows the Hobie as seen from a Para-sail. There is only one wake because the windward hull was out of the water. This picture was taken with a $10 disposable camera. Picture 4 was also taken from the Para-sail. Picture 5 shows Justin flying the trapeze as we come in. This Document is Copyright © 1998-2014 by David V. Fansler All rights reserved.